Louisville, KY, August 27, 2014 – Brown-Forman Corporation (NYSE:BFA, BFB) reported financial results for its first quarter ended July 31, 2014. The company grew reported net sales 3% to $921 million, an increase of 3% on an underlying basis. As expected, net sales growth was impacted by the difficult comparison with the prior year period when sales benefited from significant distributor and retail buy-ins, related primarily to price increases. Reported operating income increased 1% to $221 million, an increase of 7% on an underlying basis. Diluted earnings per share increased 5% to $0.70 compared to $0.66 in the prior year period. Underlying net sales grew 15% (+10% reported) in the emerging markets, a continuation of the strong trends the company has been experiencing in these fast growing markets. The company drove double-digit growth in many emerging markets, including Turkey, Russia, Brazil, and Indonesia. Results in Mexico benefited from the comparisons to last year’s first quarter inventory reduction, while results in Poland remained under pressure following the excise tax increase that occurred at the start of the calendar year. As expected, top-line results in the United States were negatively impacted by difficult comparisons with the prior year’s price-driven buy-ins, resulting in flat underlying net sales (-2% reported). The reduction in inventory levels at both distributors and retailers resulted from the company’s decision to slow the rate of price increases versus each of the prior two years. In addition to more favorable inventory comparisons over the balance of fiscal 2015, the company expects continued improvement in volumes in this important market. Underlying consumer takeaway trends for Jack Daniel’s Tennessee Whiskey have improved to 1% volume growth over the last three months versus a 1% decline over the last twelve months. In developed markets outside of the United States, underlying net sales declined 1% (+2% reported). Underlying net sales declined double-digits in the United Kingdom and Germany due to multiple factors, including challenging prior year comparisons in both markets, a reduction in trade promotions in the United Kingdom, and variability in purchasing patterns in Germany. Underlying net sales in France grew double-digits, helped by the launch of Jack Daniel’s Tennessee Honey in that market earlier this calendar year. Australia, Canada, Belgium, and Netherlands registered solid gains in the quarter. Underlying net sales declined in markets such as Italy and Spain where economic conditions remained weak, as well as Japan, which faced challenging comparisons with the prior year’s distribution gains. Global Travel Retail delivered 22% underlying net sales growth (+31% reported), driven by price increases, successful innovation, and new product launches. The company’s underlying net sales growth was led by the Jack Daniel’s trademark, up 5%. Jack Daniel’s Tennessee Honey grew underlying sales by 29%, powered by large gains in new markets outside of the United States. Markets that were launched in prior years, including the United States, continued to grow in the quarter driven by the combination of price and volume growth. Brown-Forman’s portfolio of super and ultra-premium whiskey brands, including Woodford Reserve and Woodford Reserve Double Oaked, Jack Daniel’s Single Barrel, Gentleman Jack, Sinatra Select, No. 27 Gold, and Collingwood collectively grew underlying net sales by double-digits. Old Forester also grew underlying net sales double-digits, and Woodford Reserve’s family grew underlying net sales 29%. Finlandia vodka’s family of brands experienced a 13% decline in underlying net sales due primarily to weakness in Poland, where the combination of a reduction in trade and retail inventory levels and challenging economic conditions negatively impacted results. El Jimador and Herradura grew underlying net sales by 15% and 20%, respectively, with double-digit gains in both the United States and Mexico. Results in Mexico benefited from favorable comparisons versus the prior year’s period of inventory reductions following price increases taken in that market. Southern Comfort, along with some of our other premium liqueurs brands, continued to decline, driven by continued pressure from flavored whiskies as well as weakness in the on-premise. Southern Comfort’s family of brands experienced a 7% decline in underlying net sales. Company-wide price/mix improvements contributed approximately two points of sales growth. Better price/mix, along with lower costs helped deliver gross margin expansion of 50bps. Underlying A&P spend declined by 4% (-4% reported) due largely to timing, and underlying SG&A increased by 8% (+9% reported), reflecting the impact from the route-to-market changes made in France on January 1, 2014. On July 24, 2014, Brown-Forman declared a regular quarterly cash dividend of $0.29 per share on its Class A and Class B common stock. The cash dividend is payable on October 1, 2014 to stockholders of record on September 8, 2014. Brown-Forman has paid regular quarterly cash dividends for 69 consecutive years and has increased the dividend for 30 consecutive years. During the first quarter, the company repurchased a combined total of 0.1 million Class A and Class B shares for $10 million, at an average price of $90.85 per share. Year-to-date through August 25, 2014, the company had repurchased a combined total of 1.2 million Class A and Class B shares for $108 million, at an average price of $90.83 per share. The remaining share repurchase authorization as of August 25, 2014 totaled $95 million. The geopolitical environment remains fragile, particularly in Russia, where iconic American brands are experiencing increased scrutiny, including some of Brown-Forman’s brands. Assuming no deterioration in current global market conditions, the company is reaffirming its growth outlook for fiscal 2015, including 6-8% growth in reported and underlying net sales, and 9-11% growth in reported and underlying operating income. While first quarter results were negatively impacted by inventory reductions, the company expects stronger reported and underlying results over the balance of the year, driven by more stable inventory levels and expanding global demand for the company’s portfolio of brands. The company also expects diluted earnings per share of $3.25 to $3.45, which now incorporates an anticipated negative impact from foreign exchange of $0.06 per share, partially offset by a lower expected tax rate of 29.5%. A live audio broadcast of the conference call will also be available via Brown-Forman’s Internet website, https://www.brown-forman.com/, through a link to “Investor Relations.” For those unable to participate in the live call, a replay will be available by calling 855-859-2056 (U.S.) or 404-537-3406 (international). The identification code is 83064342. A digital audio recording of the conference call will also be available on the website approximately two hours after the conclusion of the conference call. The replay will be available for at least 30 days following the conference call. For more than 140 years, Brown-Forman Corporation has enriched the experience of life by responsibly building fine quality beverage alcohol brands, including Jack Daniel’s Tennessee Whiskey, Jack Daniel’s Tennessee Honey, Southern Comfort, Finlandia, Jack Daniel’s & Cola, Canadian Mist, Korbel, Gentleman Jack, el Jimador, Herradura, Sonoma-Cutrer, Chambord, New Mix, Tuaca, and Woodford Reserve. 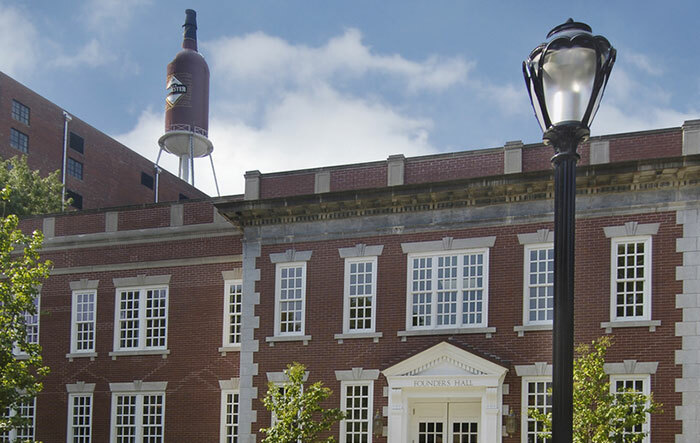 Brown-Forman’s brands are supported by nearly 4,200 employees and sold in approximately 160 countries worldwide. For more information about the company, please visit https://www.brown-forman.com/. 2 We present changes in certain income statement line-items that are adjusted to an “underlying” basis, which we believe assists in understanding both our performance from period to period on a consistent basis and the trends of our business. Non-GAAP “underlying” measures include changes in (a) underlying net sales, (b) underlying cost of sales, (c) underlying gross profit, (d) underlying advertising expenses, (e) underlying selling, general and administrative expenses and (f) underlying operating income. A reconciliation of each of these non-GAAP measures for the three-month period ending July 31, 2014, to the most closely comparable GAAP measure, and the reasons why management believes these adjustments to be useful to the reader, are included in Schedule A in this press release. 3 Takeaway trends are a blended average from Nielsen data as of July 19, 2014 and NABCA data as of July 31, 2014. Use of Non-GAAP Financial Information This press release includes measures not derived in accordance with U.S. generally accepted accounting principles (“GAAP”), including constant currency net sales, underlying net sales, underlying advertising expense, underlying SG&A, and underlying operating income. These measures should not be considered in isolation or as a substitute for any measure derived in accordance with GAAP, and also may be inconsistent with similar measures presented by other companies. Reconciliations of these measures to the most closely comparable GAAP measures, and reasons for the company’s use of these measures, are presented on Schedule A and B attached hereto.